Vancouver, BC – May 23, 2018: Bonterra Resources Inc. (TSX-V: BTR, OTCQX: BONXF, FSE: 9BR1) (the “Company” or “Bonterra”) is pleased to announce that it has entered into a letter of intent (“LOI”) with Beaufield Resources Inc. (TSX-V: BFD) (“Beaufield”), whereby Beaufield has granted the Company an option to acquire a 70% interest (the “Option”) in 81 strategic mineral claims totaling 3,590 hectares, located in the Urban Barry Greenstone belt, Quebec, Canada, and known as the Duke property (the “Property”). The Property is an assemblage of contiguous mineral claims located immediately adjacent to the northern boundaries of the Company’s Urban Barry properties containing the Gladiator Deposit and extensions. This includes a narrow inset of claims that interrupt the western continuity of claims in the Gladiator region known as “The Gap”. This land package also contains numerous gold showings with expansion potential including Lac Rouleau and Zone 18. The general geology is considered to be similar to that of the Gladiator area, with numerous occurrences of structurally controlled shear hosted vein mineralization on or near mafic volcanic contacts in proximity to both felsic and mafic intrusive units. 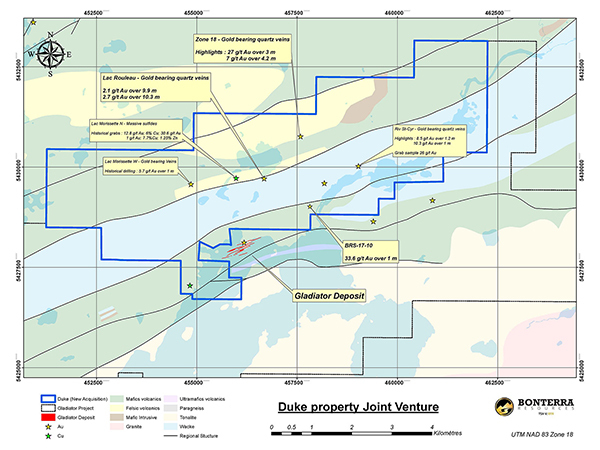 “The ability to secure the strategic mineral claims immediately north and to the west of the Gladiator Gold Deposit is a significant milestone for the Company, as we continue to de-risk and advance the project. The additional claims solidify our land position within the Urban Barry Gold Camp, increase our property portfolio significantly and provide new exciting regional exploration targets that our technical team has identified. I wish to congratulate the current management of Beaufield for having the vision and understanding that proper exploration should never be hindered by claim boundaries and for making a decision that will greatly benefit shareholders of both companies,” commented Nav Dhaliwal, President and CEO of Bonterra. 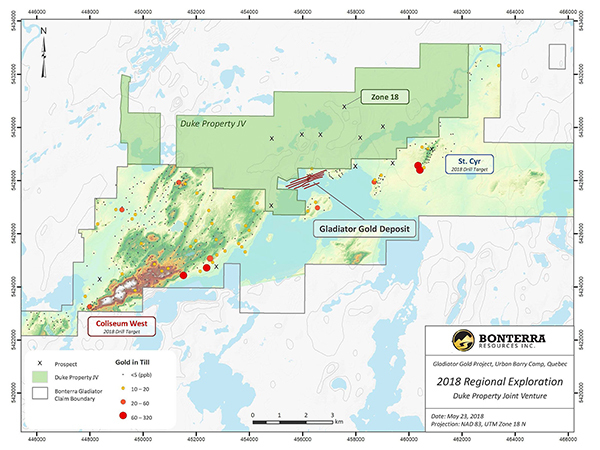 Under the terms of the LOI, which will be formalized by a definitive agreement, Bonterra can earn a 70% interest in the Property by issuing 4,000,000 common shares to Beaufield upon acceptance of the transaction by the TSX Venture Exchange, paying Beaufield a total of $750,000 in equal amounts over a three-year period, and incurring a total of $4,500,000 in exploration expenditures on the Property over three years. Upon completion of the Option, the parties will enter into a joint venture agreement on standard industry terms. The transaction is subject to the acceptance of the TSX Venture Exchange. Well financed with approximately $65 million raised in past 14 months.